Our 14X arrived in a large brown cardboard box (common for all forms of bicycles). The frame of the bicycle and the fork were separate, but both were protected and stabilized well. I took all the components out of the box and removed the packaging in a few minutes. Once I had everything out, I saw that building the bike was as simple as installing the fork, handlebar, and seat. Happily, Strider included easy to read instructions as well as all the tools necessary for assembly. Now before you run for the hills at the word “assembly”, realize that to put the bike together you only needed to tighten two bolts. It was so easy in fact, I had my 5-year-old son do it. As the recipient of the new bike, he was happy to pitch in. So what makes the 14x different? To start, this bike incorporates the features that Striders are known for. It is lightweight, has foot platforms for coasting, and a great fit and finish. 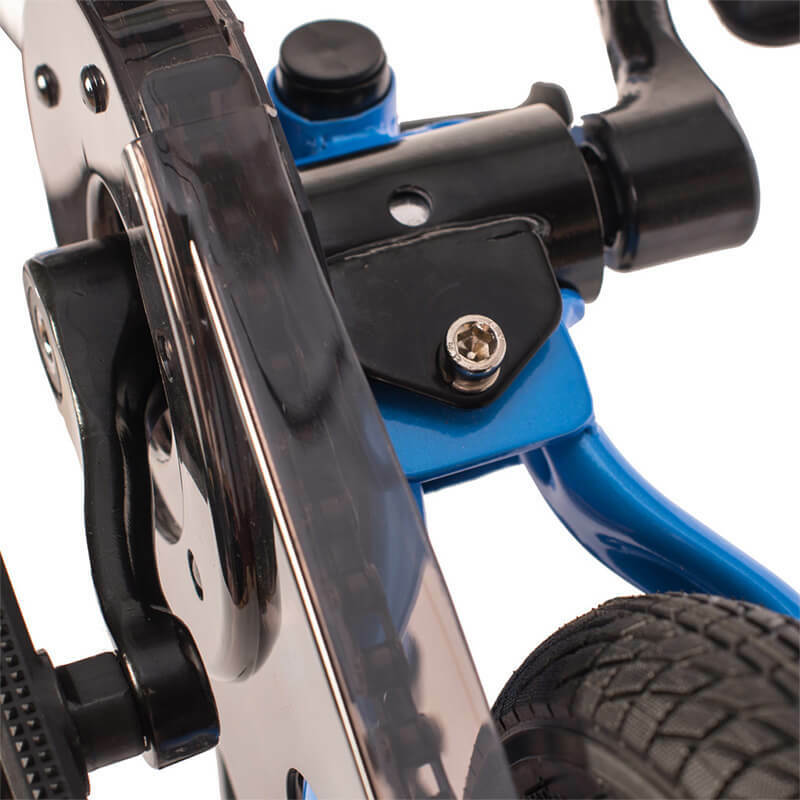 Additionally, it has a massive amount of adjustability In the bars and seat so your child can really grow with the bike. 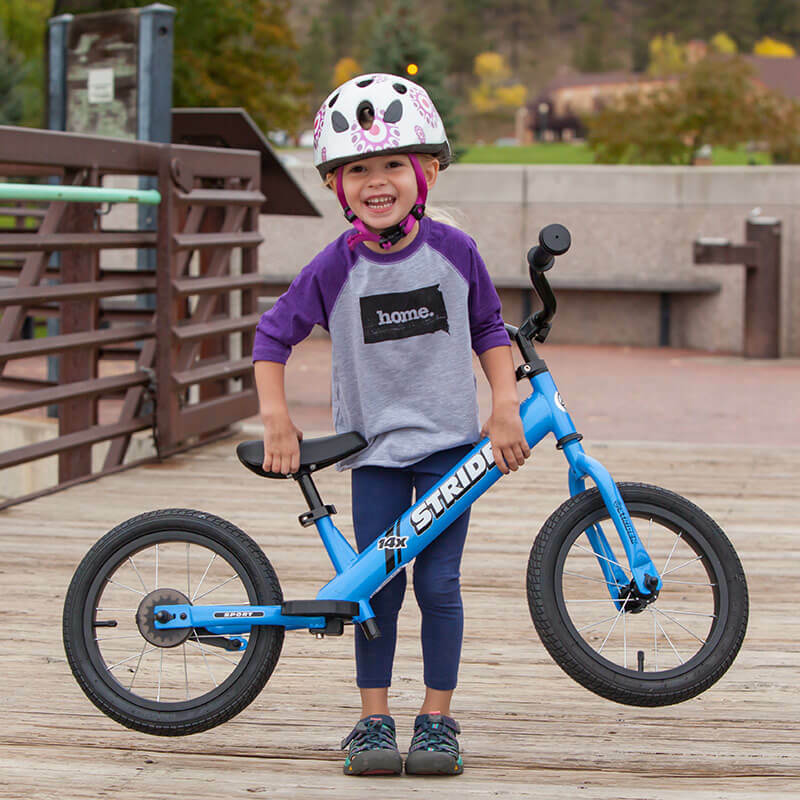 Where the 14X really sets itself apart is its ability to transition your child onto a pedal bike. 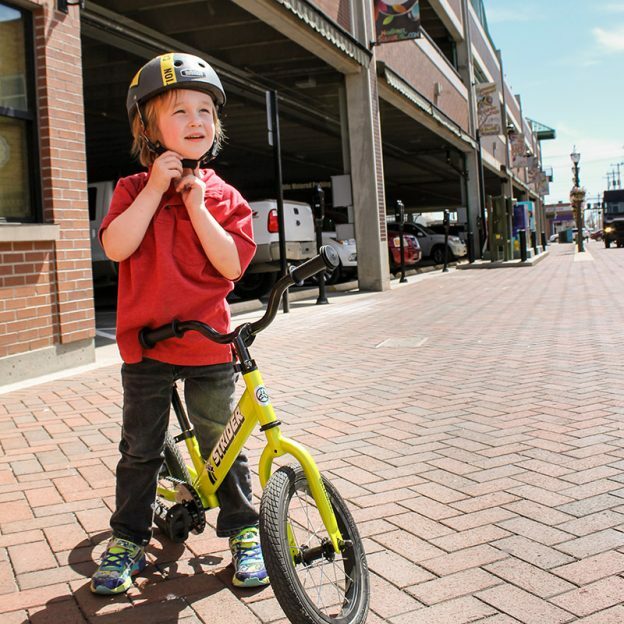 As an example, in the story of Strider, Ryan McFarland taught his son to balance on a prototype Strider, then transitioned him onto another bike with pedals. For some kids, that change in bikes is difficult. For the 14X, one simply needs to install the pedals once their child is ready for them. That way the child’s position on the bike stays the same, his comfort is high, and he can focus only on the new propulsion system. Brilliant! The 14X is designed for kids from about 3 years to 7 years old. Overall, reviewing the number of adjustments tells me that this range is totally achievable. Although if you are a 3-year-old on the small side or a large 6-year old, you may not quite fit. Like building the bike itself, installing the pedal system is really simple. A few bolts secure the cranks in place, the chain goes on easily, and the included chainguard is easy to place. Once everything is installed, this bike looks like a normal bike with a few great features. First, the cranks are narrower than most other bikes, so they match the narrow width of kids hips. Also, the low overall stance of the bike is really confidence inspiring for riders just starting out. I plan to really try this whole system with my younger son. As of now, he isn’t riding on two wheels, and I would love to get him started. We will progress from the balance features, into the pedal features and really test this concept. Stay tuned for more on his progress and how well the Strider worked for him. This entry was posted in News and tagged balance bike, different balance bikes, family riding, hotwalk, kids bike, kids bikes, learn to ride, learn to ride a bike, like riding a bike, perfect kids gift, SKuut, strider, Strider 14x, teach my child to ride a bike, training wheels vs. balance bike on November 28, 2017 by John Brown.